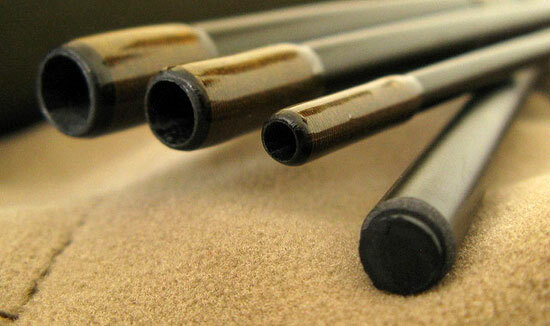 Question: Are most fly rods handmade, or are they manufactured by machines? Do hand-made rods cost more? Answer: I still remember the first time I visited a fly-rod “factory,” in 1997, when I received a tour of the Scott Fly Rod facility, which was then located in Montrose, Colorado. (They’ve since moved to Telluride.) I expected to see all kinds of gleaming machines and equipment, but instead, there was a diverse group of actual human beings creating rods out of the raw materials—graphite, resin, fiberglass, epoxy, paint, thread, and cork. As the tour took us through the process of how a fly rod is made, we witnessed the graphite prepreg cut into flags by hand, the flags rolled onto the mandrels by hand, the mandrels hung in the oven by hand, and on and on. The ultimate human-centered part of the process was the guy whose job it was to check the fit of the spigot ferrules on every rod. He would grasp two rod sections, fit the ferrules together, twist the sections back and forth, and then hold the male ferrule to his lip. Apparently, because the lips are more sensitive than the fingers, he used his lips to feel for any hot spots, which would indicate an imperfect fit. He had a vertical stripe of graphite dust from his nose to his chin, and when he found a hot spot, he would sand it down until the ferrule fit perfectly. He seemed perfectly happy with his work. I’ve since visited several other fly-rod shops (it doesn’t seem to make sense to call them “factories,” given how little automation there is) including bigger operations like Sage and Orvis, and I’m always impressed by how many people actually touch a fly rod during its manufacture. Once the blanks come out of the oven, they are hand-dipped, hand-painted, and the guides are wrapped by hand. One rod-shop manager recently told me that he had bought foot-pedal-controlled machines to help his rod-wrappers, but that most had declined, choosing to do it the old way. It’s interesting to note that, as materials have changed drastically to incorporate high-end graphite-and-resin technology, the process for actually turning that stuff into a fly rod has barely changed at all. Each rod shop has its own little tricks for making the process faster, more accurate, or more consistent, but they are all very similar and very human-centric.